A writer of songs, a player of guitar, a singer of sorts, a silly guy in shorts. Not a dancer. An all-around plasma factory on wheels. Yeah, but who's the dame? That's Liz Pagan, the wife and musical partner. They've been married 11 years, although it seems like forever. So how did they get together? 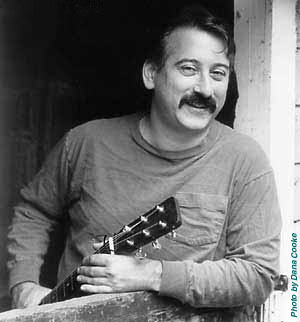 Dave was a founding member of the Folk Project, a New Jersey music organization. But he left the local folk scene to make babies and play lead guitar in cover bands. He did time at bars, weddings and other private functions for may long years. Meanwhile, Liz, a graphic designer living in Manhattan, found the Kleiner-less Folk Project. She had been singing and playing guitar, often at the Jersey shore, since teenhood. When Dave returned to the Folk Project while going through a divorce, he brought with him an arsenal of songs he had written over the years. Songs that were seldom heard outside of his basement, where he serenaded the furnace. There were songs about food (Too Many Restaurants), women (The Women Don't Like Me), and parenting (Just Don't Have Time for You), all with a unique perspective and wry sense of humor. Eventually, Dave and Liz found each other. Liz's voice added a richness to Dave's music, and they began performing (and living) together. They have released three CDs, rhymes with diner and BaD TaSTE, and Salesman, each with twelve original Kleiner songs. They have been heard nationally on Mike Flynn's Folk Sampler, Dr. Demento's radio show, NPR's Car Talk, and many other radio shows across the country. Dave's song Here's To The Rocky Road, co-written with Steve Gillette and Dennis Dougherty, appears on Steve's album Texas and Tennessee on Redwing Records. Dave and Liz can also be heard on the Sounds of Weirdness CD, released recently by Weird NJ magazine. Liz is a freelance graphic designer whose credits include the Bob Franke Songbook and For The Beauty of the Earth, the Clearwater environmental songbook. In Dave and Liz's performances a genuine love of music comes through, and a sense of fun and camaraderie thatis contagious. Between the laughs, a few inspiring moments manage to catch you when you least expect in. You may realize that there is more going on here than silly puns and self-deprecating jokes. Dana Cooke is our buddy who took some of the photos on this site, and wondered why there was no link to his web site. Now there is.